I have been a bad, bad, BAD blogger! *hides face in shame* I meant to do weekly posts, I really did. I don't know what happened. Life, I suppose. lol. My husband graduated from law school finally, my daughter finished up first grade, my uncle passed away... life has been crazy. But isn't it always? However, this, this post is not for me. I have someone really wonderful I'd like to introduce you all to! A while back I did an interview with my good friend Sue and I really wanted to do more features here in my wee space. 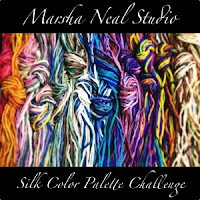 I need to get my beading and creating mojo back and what better way than to share with you all creative people I adore? Today I'm going to introduce you to my dear friend, Mary. You may know her as her Flickr/Etsy persona, Blythette :) She is a warm, beautiful, creative person and so very talented! 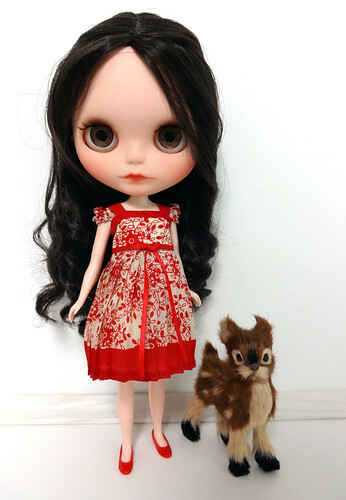 I have been in this wonderful world of Blythe for about a year and a half now and am always amazed at the skill shown in the community. 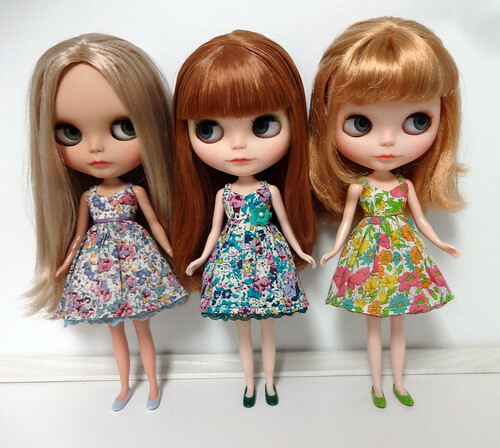 Mary both customizes and make the most exquisitely delicate and lovely doll dresses! 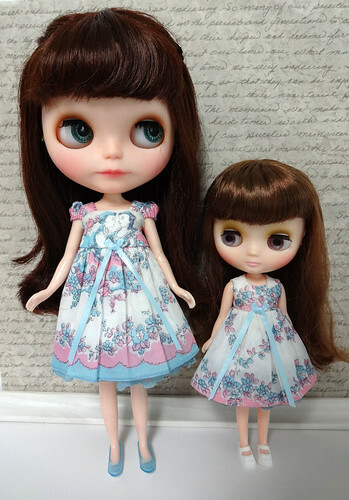 Before I give you her interview, I'd like to show you an example of her work, here is a beautiful doll customized by Mary and wearing one of her beautiful dresses! Isn't she beautiful? And that dress! Eep! You can see many more of her amazing creations in her Flickr (HERE), including her latest girl who is up on the bay! Here is a sneak peek of her, then keep on scrolling to read about the lovely and wonderful Mary! 1) Where and when did your obsession with creating things begin? I've been creative since I was really little! My parents were always encouraging and I went to all art schools since 6th grade on to college. Being obsessive with creating things is highly encouraged in art school. 3) Who is the most inspiring person in your life? Why? My mother is a big inspiration to me. She is always so strong and loving no matter what the circumstances. I admire her greatly for that! 5) How did you find Blythe? What drew you to her? In 2002 I was at an art museum and I found a little packet of post cards with Gina Garan's Blythe photographs. I was immediately fascinated! I was in college at the time and Blythes were just way too financially out of my reach. 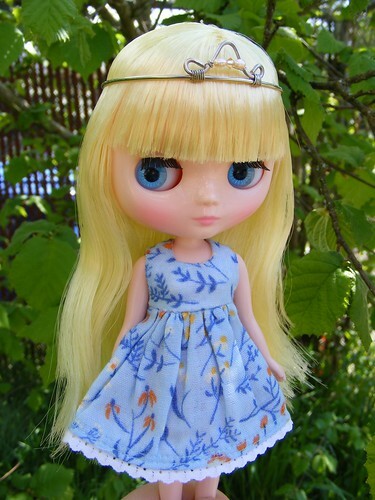 Two years ago, I was given an ADG Blythe for my birthday! The madness all started then! 7) What is your favorite thing about where you live? Why? I love living in Miami, FL. There is green everywhere! I love that it is always so lush and beautiful here! What five things couldn't you live without? Hmm...Does it have to be things? 1. My sister Angie 2. My mom and dad. 3. My cats. 4. My ipod filled with unlimited audio books and music. 5. Lots of wonderful salty things to eat. I know that list is full of cheats...oh well! 9) What is the best part about Blythe? About the community? The best part about Blythe is that i get to be creative! I can use everything i have learned in all of my years of art school in one medium. How fun is that!! I have heard nightmares about the community, but I am so fortunate to have met such nice people and I feel blessed to have Jenn as my friend! 10) Anything else you'd like to tell us about you? About your work? I'm really pretty boring but I do love what I do and I give everything 110%. Whether it is cooking, making art or even caring for the people I love. I believe there is no point in doing anything if you are not going to try your best and give it your all! Now, go forth and check them out ;) I hope you are having a fantastic week!